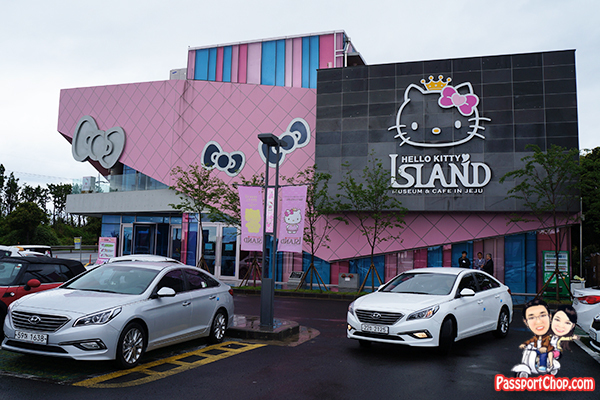 After a morning of fun at the Jeju Alive Museum, we proceeded on to another interesting themed museum – the Hello Kitty Island (also known as Jeju Hello Kitty Museum). The Korean GPS coordinates (by phone number) to get to Hello Kitty Island is 7926114 – just input this number into the onboard GPS provided with your KT Kumho rental car. Do note as we are on a self-drive 4D3N Jeju itinerary, I am unable to advise on how to get to Hello Kitty Island by public transport – some instructions we found online: Jeju Intercity Bus Terminal → #750 (toward Seogwipo) → Sumbinari [40mins] → Walk to Hello Kitty Island (hope this helps). Entrance fee for the Hello Kitty Island for adults is 12,000 Korean won (KRW) and children: 9,000 KRW – about 12 USD and 9 USD respectively. 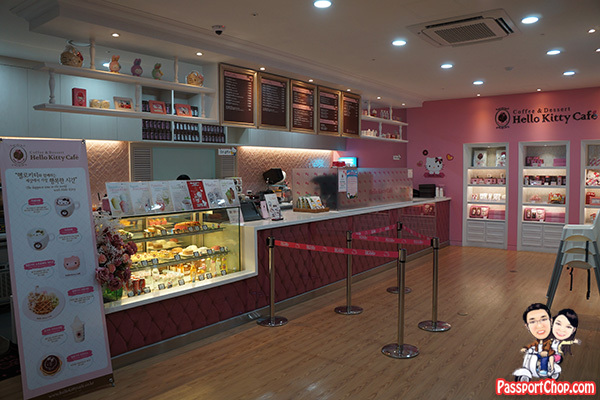 Even if you just want to pop by for the Hello Kitty cafe, you will still need to pay for the Hello Kitty Island admission fee. Hello Kitty Island is open from 9am onwards. Parking here is quite limited – as the Hello Kitty Island is not located in town, there isn’t a lot of sidewalks for you to anyhow park so you can only park at designated parking lots but the best part is parking at Hello Kitty Island is free. There is a lot to do in Hello Kitty Island with lots of special Hello Kitty-themed exhibition halls e.g. Kitty History Hall, Art Education Hall, Music Education Hall, Art Gallery, World Gallery Hall, Trip around the World Gallery Hall, Constellation Education Hall, Planned Gallery, Hello Kitty Café, 3D Theater, Outdoor Modeling Gallery and more. 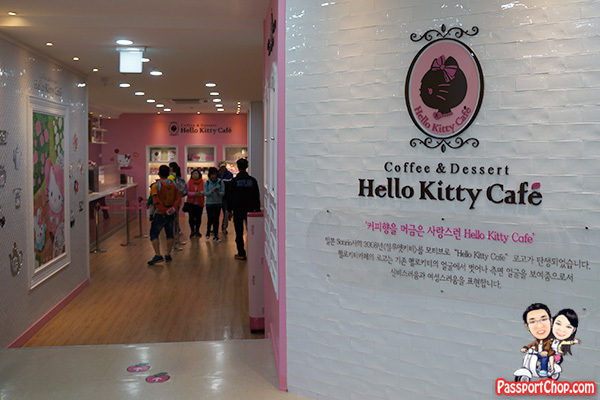 If you are a huge fan of Hello Kitty – you must go for this Jeju Hello Kitty Island otherwise don’t bother – you might get bored by the extensive Hello Kitty display. 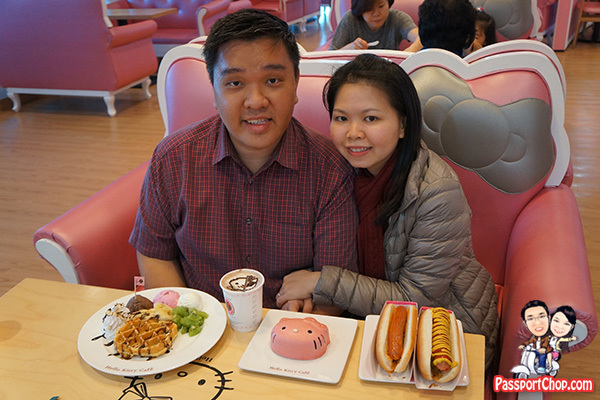 Before exploring the rest of the Hello Kitty Island, we settled down for lunch at the Hello Kitty Cafe. 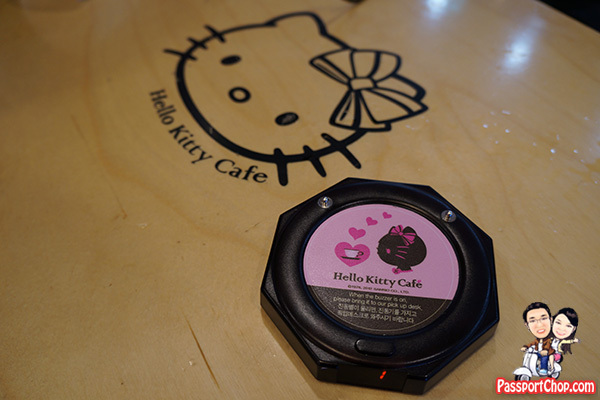 … you will receive a buzzer which alerts you when your food is ready for collection. All self-service here at this Jeju Hello Kitty cafe. Drinking water is complimentary too – just fill up your cups with the jugs of water at the counter. 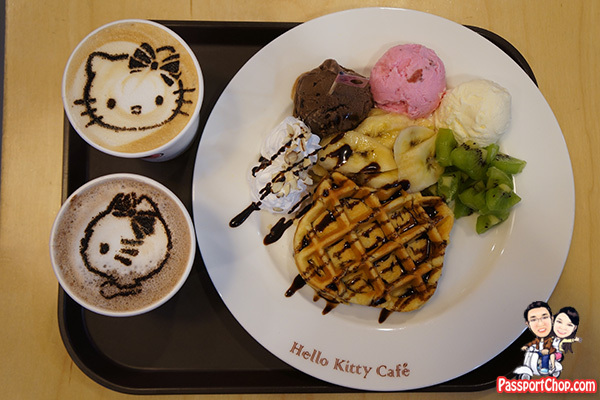 How can we skip the coffee artwork of Hello Kitty faces on their Cafe Latte – 4,500 KRW. Their hot chocolate also comes with a side profile of Hello Kitty. Yes, i know it is a 4.50 USD coffee but well, it has Hello Kitty face on it! 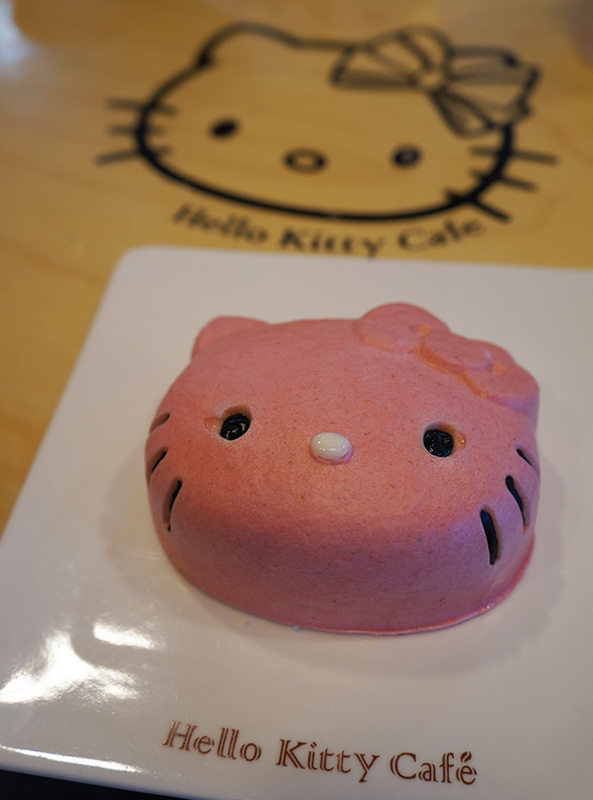 We also ordered the Hello Kitty Strawberry Cake – 11,000 KRW. The icing (what makes up the pink color face on the cake) is actually not very sweet and quite light on the palate. The insides of the cake is moist with strawberry jam fillings within the cake itself. The taste and the kawaii-ness (plus the photo-taking opportunities with the cake) more than makes the 11 USD worth it, at least in my opinion. 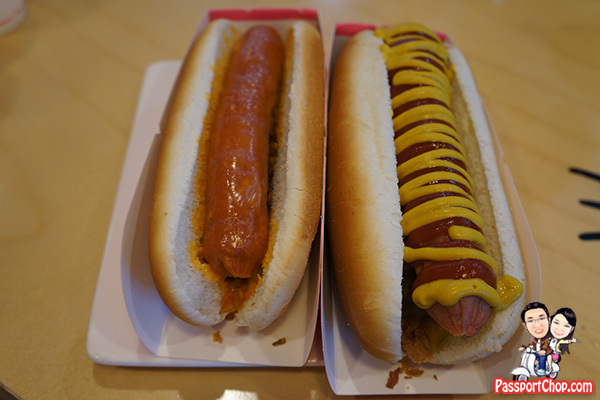 Of course, we had to get some meat in our lunch meal for our long day ahead – a drive to Mysterious Road and Loveland and Jeju city so we got some hotdogs – no Hello Kitty faces here though. 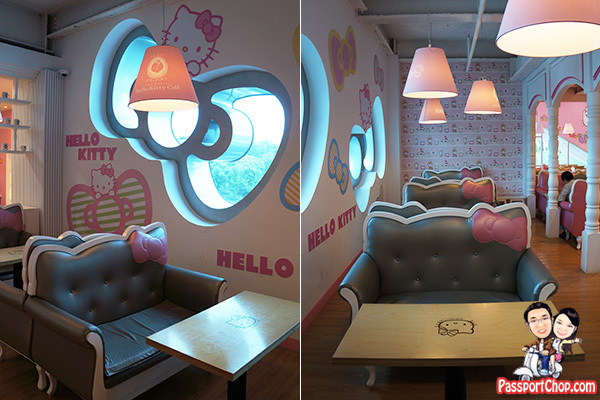 Besides the food at the Hello Kitty cafe, the interior design is also very beautiful – definitely this can serve as a source of inspiration to any home-owners who want to design their house with a Hello Kitty theme – just look at the pictures below – Hello Kitty ribbon windows – wow! 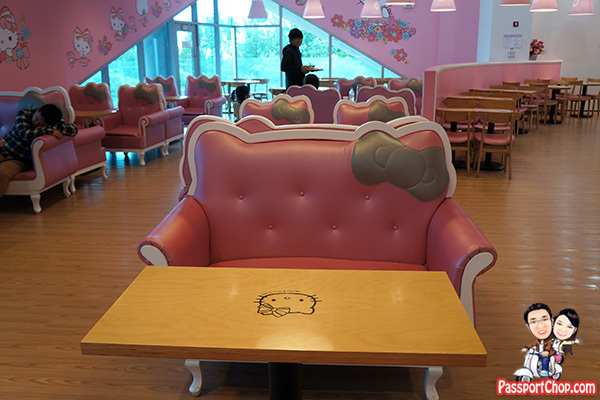 Check out the Hello Kitty-themed sofas! 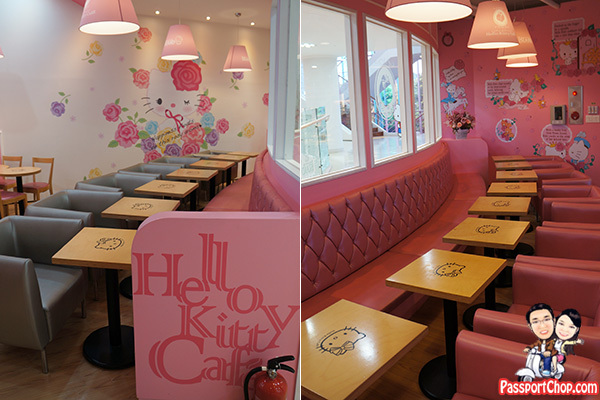 Even at the more bland dining tables and sofas – you still get a fair bit of exposure to Hello Kitty everywhere! Oh my gosh! This looks WAY better than the one I went to in Taipei!